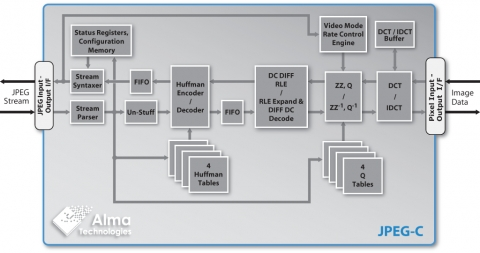 The Alma Technologies JPEG-C core is a standalone and high-performance, half-duplex Baseline JPEG codec for still image and video compression applications. Full compliance with the Baseline Sequential DCT mode of the ISO/IEC 10918-1 JPEG standard makes the JPEG-C core ideal for interoperable systems and devices. In addition to the standard Baseline JPEG streams, the core is also capable of supporting the video payload of many (de facto) standard motion JPEG container formats. The JPEG-C can also be enhanced with an optional add-on bit-rate control block, which will benefit the bandwidth constrained applications. The core is designed with simple, fully controllable and FIFO-like, streaming input and output interfaces. Being carefully designed, rigorously verified and silicon-proven, the JPEG-C is a reliable and easy-to-use and integrate IP. Baseline ISO/IEC 10918-1 JPEG Compliance. Programmable Huffman Tables (two DC, two AC). Programmable Quantization Tables (up to four). Up to four color components. Supports all possible scan configurations and all JPEG formats for input and output data. Supports any image size up to 64K x 64K. Supports DNL and restart markers. Up to 4 image components are supported. Supported sampling factors: 1, 2 and 4. Decoding of corrupted JPEG streams is not supported. Simple, microcontroller like, programming interface. High speed, flow controllable, streaming I/O data interfaces. Avalon-ST compliant (ready latency 0). Automatic self-programming by JPEG markers parsing. Single clock per input sample processing rate. Automatic JPEG markers generation on the output. Trouble-Free Technology Map and Implementation. Fully portable HDL source code. Strictly positive edge triggered design using D-type only Flip-Flops. No need for special timing constraints.